We’re building, building, building. (via @taskave) < watch for these guys. trust me on this one. @bgilham Keep up on this great startup. Looking forward to seeing you progress with the concept. Love the favour concept BTW. RT @Intelliware_Inc: Martin Fowler at #att10 keynote on Agile. Pack house. @animal appreciate the feedback. Feel free to link in and let’s talk more about that guest spot. Always happy to help out with context. Listening to Martin Fowler at #att10. Collecting video interviews over the course of day with persevered and attendees. Tweet me to meetup. A year ago, I was fortunate to attend and blog the Agile Tour ’09 Toronto Conference. At that event, I received an iPod Touch that would become a key element of the architecture that supports the @RLavigne42 projects. This year, I wanted to give back to the event that gave to me. I am proud to announce, that The RLavigne42 Podium will be providing video coverage of the *Sold Out* Agile Tour ’10 Toronto Conference on October 20th, 2010. Not only will I be capturing 720p highlights of the event, but I will be providing opportunities to the speakers to video tape a 3 minute summation of their presentation. I will have candid chats with attendees and colleagues. All of these will be part of the upcoming YouTube @RLavigne42 Segment – ##TDGv Agile. I will be providing a OOMP at the beginning event outlining my efforts for the day. The team has put together a fantastic line up of guests and well rounded Agile coverage. The Conference Program for Agile Tour Toronto ’10 is keynoted by non other than Martin Fowler. Please check out the conference schedule for a detailed look at the speakers and topics. There is no doubt in my mind that this is a step up and a move forward for the team putting together this now yearly event. If you wish to view past @RLavigne42 Segements, here is a handy list of recent projects. I was talking with my RHB-pal, Dave Howlett, on Facebook a few days ago about the problem with Social Media Experts. I made a point of stating how many of these so-called “experts” were quite often pushing social tools (e.g. Twitter, YouTube, Facebook) without a clear understanding on their proper use. I ended my mini-rant with a statement that many social tool adopters were left stuck in a broadcasting mindset, leaving them wondering why they weren’t finding success. This lack of success was often leaving a bad impression on not only the toolsets being promoted, but more importantly a bad vibe on the entire consultancy process around their adoption. Dave Howlett, who leads the Real Human Being Nation, shared his infinite Third Gear wisdom with me after my rant. Dave indicated that it was not the social tools themselves that were flawed, but that people were using them in the wrong gear. 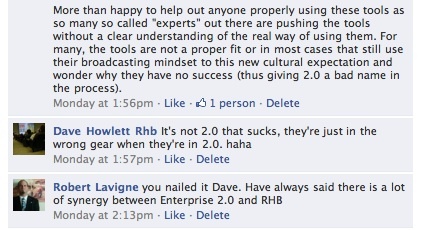 Not only was Dave 100% correct in his assessment, but he clearly established a link with Enterprise 2.0 / Social CRM success and his Third Gear philosophy. In his Knocking Down Silos lecture series, Dave Howlett outlines the Three Gears using a morning commute analogy. Second Gear on the Highway (reciprocity behaviour) – characterized as being courteous to others as long as they are courteous to you (waving a guy in front of you and expecting a wave in return). The danger of second gear is that when the expected rewards/outcome does not occur, or not within a timely fashion, the individual resorts to first gear. Third Gear on the Highway (the “good guy” or “amazing woman” behaviour) – doing the right thing whether people thank you or not. Detaching your actions from reward. Waving a car in and not getting upset when they don’t wave thanks. This is the gear of independence, employee engagement, sales excellence, inspiration leadership. Shortly after our discussion about the synergies of his RHB philosophy and the World of 2.0, Dave challenged me to come up with what I would consider to be the Three Gears of Enterprise Social Media Adoption. I make a point here of referring to Social Media Adoption as a generic term. Enterprise 2.0 deals with leveraging Social Media within the enterprise to break down existing silos and increase the overall collaboration and engagement within the Enterprise. My good friend, and fellow XBOX360 Zombie killer, Dan Keldsen helped define Enterprise 2.0 as “a system of web-based technologies that provide rapid and agile collaboration, information sharing, emergence and integration capabilities in the extended enterprise”. So without further ado, here is my attempt to describe Social Media/Enterprise 2.0/Social CRM adoption issues using Dave Howlett’s Real Human Being Third Gear philosophy. The RHB First Gear is based on self-directed behaviour. Most historical organizations and their employees clearly fall into a First Gear mindset. When implementing their social tools, they fail to gain traction due to the outdated and flawed mindset that “Knowledge is Power“. Within that mindset they find themselves hoarding their content for their own self-directed purposes. As I have often stated, Content is Free and the real value of information is in its Context. Everything is now searchable and we are seeing a triving crowdsourced Q&A community on Linkedin, Google, and Facebook. As such, any perceived value that comes from hoarding content is now very much moot in a world that is becoming more and more knowledge transparent by the day. If you choose to hoard your knowledge, do not be surprised to find yourself surplanted by someone within the larger global workforce who is willing to engage for free or in an evolving world of micro-payments for micro-engagements. For the real value is in the contextual application of this freely accessible knowledge, and commercialized innovation should be your primary value proposition. First Gear is also present when Social Media is used primarily as a Broadcasting mechanism. Although the information is no longer being hoarded per say, its bot-like mindset fails to engage the consumers in any dialogue. It is very much a “me, me, me” one-sided presentation of content that goes against the fundamental concept of the Social Web and thus the Social Enterprise. When people choose to engage with your content, you are already gone and focussing on your next PR release. Sadly many Social Media A-lister have reverted back to First Gear mentality after having found commercial success. The RHB Second Gear is based on reciprocity behaviour. No longer is information being hoarded, nor simply broadcasted. Content is now shared with the expectation of engagement and reciprocation. Collaborating with a Second Gear mindset is a very dangerous stage of adoption. This transitionary stage towards Enterprise 2.0 / Social CRM adoption is where most potential successes become unfortunate failures. The right steps are undertaken in the sharing of content, but it is done with an expectation level that is often unattainable in the infancy of adoption. While sharing content in Second Gear, you expect your “wave in return”. You expect to have your content ReTweeted, Liked, and Commented upon. When you fail to achieve this intended outcome, your real motivations of using Social Media becomes apparent. When that wave/engagement doesn’t occur, you gravitate very quickly back into a First Gear mindset. This is where many of the flawed prophets show their true colours. They fail to live up to the Social Media hype, because they themselves have unrealistic expectations and imcompatible behaviours to using the Social Media toolsets. The reality is that it take a long time to build up the momentum behind Social Media utilization. You need to become patient in getting that engagement. You need to not focus on getting 20% engagement from the 80%, but find that powerful 20% that will generate the true 80% of the value. To achieve this, you need to be willing to let many people not wave back to be able to encounter those that do and this brings us to the value of Third Gear. The RHB Second Gear is based on what Dave Howlett terms the “good guy” or “amazing woman” behaviour. While in Third Gear, your actions are dictated by the actions themselves and not the perceived or anticipated rewards that come with those actions. You know the wave will eventually come, and you will be that much richer for engaging with those that are engaging back. Third Gear is where true engagement and collaboration materializes. When sharing content with this mindset you don’t mind receiving constructive critism. You accept the knowledge that your content will be modified and mashed up into a much larger or divergent community. Hutch Carpenter wrote a great blog entry where he discusses the impact of Metcalfe’s Law and the Dundar Number on collaboration and engagement. Both Metcalfe’s Law and the Dunbar Number play a large role in finding success in Enterprise Social Media Adoption using the Third Gear philosopy. Many people have asked me why I choose to socially network with a community that is far larger than the Dundar Number permits. My reply is that I would rather find my “A-Team of 150” from a larger community, than merely turning to the 150 people that I have met in real life over the years. So I use my Third Gear philosophy to wave many people into my network by sharing openly my knowledge. I know full well that many will not wave back or engage in a manner that I hoped for. However, for those few that choose to wave back and engage I will build a much stronger and personalized “Dunbar Group” within a community that has scaled to a level where leveraging Social Media drives my commercial endeavours. First Gear of Enterprise Social Media Adoption (self-directed behaviour) – characterized by Hoarding of Knowledge and/or Broadcasting of Content leading to bot-like behaviours that fails to engage the intended audience into a collaborative encounter. Second Gear of Enterprise Social Media Adoption (reciprocity behaviour) – characterized by Sharing of Content with unrealistic expectation. Using Social Media in Second Gear leads you to revert to First Gear when someone doesn’t comment/like/retweet before gaining real engagement and collaboration. Third Gear of Enterprise Social Media Adoption (the “good guy” or “amazing woman” behaviour) – characterized by sharing content to a larger community freely, openly and without reservation, with a likely outcome of finding the truly engaged and collaborative community that you were searching for. Only through engaging using a Third Gear philosophy will you achieve the real value proposition that Social Media can deliver. Whether it is within your organization using Enterprise 2.0, or outside of your organization using Social CRM, your mindset and attitude in using the tools will determine your success or failure and not the tools themselves. Robert Lavigne researches and networks in the fields of Enterprise 2.0, Social Media, Social CRM and Personal Branding to compliment his existing Agile Development and Leadership experience. This evolutionary knowledge furthers the delivery of Real Corporate Value (RCV). The use of modern social networking tools and related mindsets fully engages business relationships and departmental convergence. Rob subscribes to the need for further contextualization of accessible content to achieve real returns in the field of Competitive Intelligence and Business Innovation.